I recently was very fortunate to be able to review a handmade, customized necklace from Sentimental Silver. I patiently waited and the day my package arrived I was so excited to open it up and see how the necklace turned out. WOW. Super Wow. My necklace is GORGEOUS. 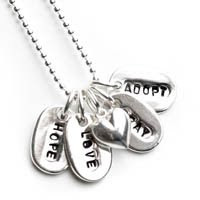 - The necklace was super shiny - some sterling silver can be dull or darker - Not Sentimental Silver. This was very light colored silver with a high sheen. Probably because their products are made with pure (.999) silver! 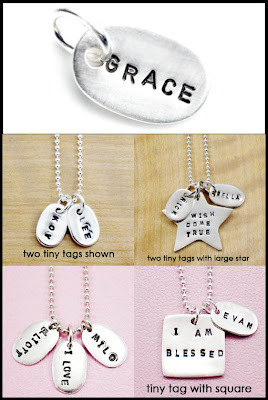 - Even though the tags were very cute and tiny, the girls names were easily readable. - The weight of the tags was perfect - they were not lightweight where they would be "floating" on the chain. Instead they hung nicely centered. - Quite simply I love the fact that this is personalized with the names of my girls, my favorite people in the world! Another product Sentimental Silver offers is their Sparkle Jewelery - this is the same as their other products but with a little bling bling. Very cute - why not add birthstones of you or your kids? Check out just some of the categories below! If you want to look at other Testimonials from satisfied customers, just click HERE. Sentimental Silver had graciously offered one lucky Blogmania reader a personailized tiny tag (chain not included), a $35 value! To register tell me what your favorite item is. * The Tiny Tag is approx 1/2 inch long by 1/4 inch wide and works best with names that are seven letters or less. In order to accommodate longer names, they will be stamped on the piece at a slight angle. If you cannot wait and want to buy an item from Sentimental Silver, please use the code word "SALE" and receive 20% off of your order!!! Main Entry: Tell me something you loved at Sentimental Silver. 1 extra entry (each) available for faving on technorati, following me in blogger/google friends, sharing on facebook, subscribing or grabbing a button. * Giveaway starts Sunday 11/15/2009 and ends Monday 11/30/2009 at 11:59pm EST. Thank you to Sentimental Silver and Chic Execs for this review and giveaway opportunity. I did not receive any form of compensation for this blog post other than the product to review. For more information on this blog and my posting practices, please refer to the disclosure policy below at the bottom of this page.